The Accreditation Council for Graduate Medical Education has approved the creation of a new residency program in physical medicine and rehabilitation (PM&R) at UNMC. "The number of physicians trained in PM&R (termed physiatrists) in Nebraska is considerably below the national average and does not meet the current, let alone the future, demand for such services," Dr. Britigan said. "Physicians tend to practice within 100 miles of where they complete their residency training. There are no residency training programs in PM&R in the upper Midwest, including South Dakota and Iowa. Thus, it has been very difficult to recruit physiatrists to Omaha or Lincoln, let alone to the more rural parts of the state. "Having a residency training program in Nebraska will hopefully enhance the supply of physiatrists to the region because they will have trained here." Under the leadership of program director Michael Weaver, D.O., the program will begin interviewing potential residents this fall and will welcome its first class of four residents in July 2018. The program will total 16 residents when it reaches capacity after its first four years. The program is the 87th PM&R residency in the country, Dr. Weaver said, and one of two new residency programs in its field approved by ACGME in 2017. UNMC has affiliated with Madonna Rehabilitation Hospitals and collaborated with Nebraska Medicine to provide first-year training sites, and the program is planning to work with Children's Hospital & Medical Center and the VA Medical Center, as well. The four-year program will include a transitional or preliminary year prior to the resident undertaking three years of specialty training in PM&R. Dr. Weaver, who was recruited from the University of Louisville to develop and lead the new program, said PM&R is a specialty that has been underrepresented in the Midwest. "When you look at most of these programs, they're largely found on the East and West Coasts, with fewer in the Midwest," he said. "The patients haven't known what they've missed by not having our specialty available to them. We're trained in caring for those patients with disabilities and life-changing events or conditions that have altered their path, and we can really help them get back on course and hopefully get them back to their fullest potential." The availability of this residency-training program will greatly improve the availability of physicians able to provide high quality rehabilitative care to the citizens of Nebraska and the surrounding region, said Brad Britigan, M.D., dean of the UNMC College of Medicine. The creation of the residency program follows on the creation of the UNMC Department of Physical Medicine & Rehabilitation in 2016. Samuel Bierner, M.D., is the founding chair of the department. Dr. Britigan congratulated Dr. Bierner and his staff, as well Paul Dongilli, Ph.D., president and CEO of Madonna, "whose hard work and dedication have made this possible." 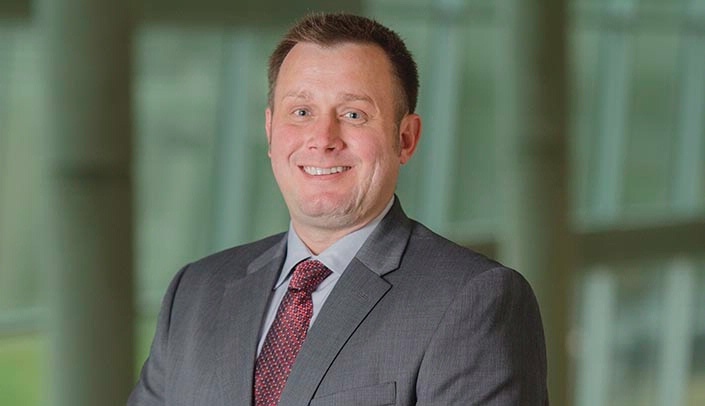 "The partnership between UNMC and Madonna Rehabilitation Hospital that allowed for the creation of the UNMC Department of PM&R and now this residency program is one that I greatly value and look forward to seeing further develop going forward," Dr. Britigan said. Having the residency program approved points to the continued growth and impact of the new department, Dr. Weaver said. "It still is an ongoing process, but we have laid a strong foundation and the roots to supply excellent resident education," he said. "The department is an evolving entity and there are several areas in which the clinical enterprise can involve our services. There are truly multiple opportunities for continued growth within this department and the university with this new program." Congratulations to everyone that made this possible!